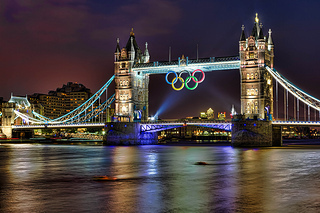 In my humble opinion the Olympics were a glorious success for London. Whether or not they actually made any money from event, I don't know, but the long term benefits in terms of tourism from show-casing London and British culture, combined with the motivational effect on people of all ages to get more active must be tremendous. One potential negative side effect that I've discussed with a number of people, however, is the long-term effect of having asked so many Londoners to change their working habits during the Olympics in order to ease the burden on the transport system. Most people, of course, will already have gone back to their regular working patterns. However, there will always be a number of marginal cases, people who were already open to or even considering the idea of changing their working habits. Will this experience have tipped them over the edge? Will they never return? Fortunately, a survey by Vodafone UK, has provided some indication of the answer to these questions. Apparently, 24% of people said they had changed their working patterns to work from home or an alternative location at least some of the time. And apparently nearly three quarters of them said they'd worked more productively as a result of the change, owing to fewer disruptions and less time spent commuting. Over half of respondents said they'd like to continue their flexible working arrangement. While 30% said their bosses already allowed this, another 23% said they thought their bosses would be more open to the idea as a result of the experience. That's a lot of percentages to mull over, but one must conclude that the Olympics will have caused a step change in working habits in and around London. I'll leave it to you to decide for yourself, whether you think that is a good thing or not, but I can't help thinking that Boris must be wondering whether he scored an own goal this Olympics.